"Biological diversity is the key to the maintenance of the world as we know it." 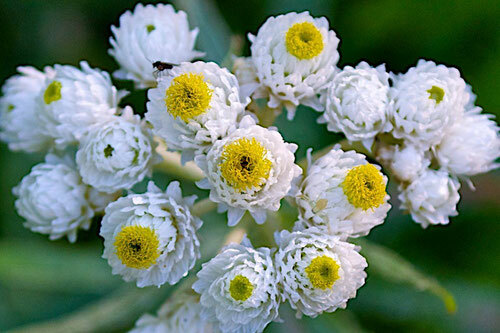 Western Pearly Everlasting (Anaphalis margaritacea) a native perennial at Distant Hill Gardens. What are Native Plants ... and Why are they so Important? At Distant Hill Gardens we use a functional definition of "native" plant as opposed to a chronological or geographic definition. Instead of thinking of a native as one that grew here prior to a certain date, such as before European colonization, we like to think of a native plant as one that has evolved in this location long enough to be able to establish a specialized relationships with the ecosystem. It really doesn't matter how long a plant has been present. 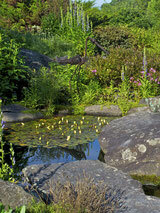 What matters is if a plant adds to the ecosystem of Distant Hill Gardens. "Native" plants are important because of the direct connection between them and the insects, birds, and other wildlife that feed on them. In many cases native insects will not feed on non-native alien plants. This give the non-native plants an advantage over the native species in their survival. As the native plants are slowly replaced by alien species, many native insects will also begin decreasing in number. As a result, many of the birds that rely on these insects for food will also decline - an unending downward spiral. 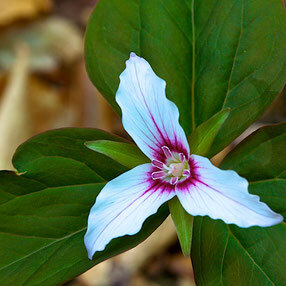 A Native Painted Trillium (Trillium undulatum). Due to the large number of Natural Communities found at Distant Hill, we have a very bio-diverse collection of native plants and fungi growing on the property. It has since been determined that the plant kingdom is more complicated and includes several other groups, like fungi, lichen and algae, that are not true plants. In an attempt to keep things simple, we are using Aristotle's definition of a plant and include fungi, lichen, and algae in the lists above even though they are not now considered plants.